I have a number of favorite movies I pull out at least on a yearly basis. They are all different, but what binds them is that they make me feel good in some way. 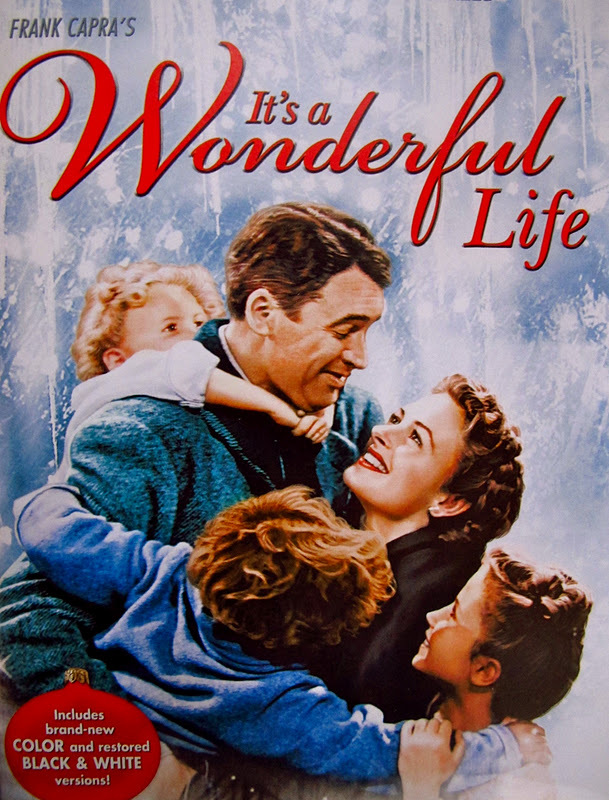 One of my old companions is “It’s a Wonderful Life,” about life’s adversities and the power we each have in life to conquer our own issues, but more importantly, the influence we have on others. I have never watched this movie without crying (big surprise.) The lesson is so simple and pure and yet so powerful. We have much more personal power than most of us will ever know in this life. I think that’s what’s so sweet about the movie, is that it takes an angel, Clarence, to show George the many ways he has changed the world … for the better. And in my mind, George is you, my reader … George is me, my sweet husband and kids, all of my loved ones, and even those I’ve seen fit to part ways with. We all have infinite power to lift others, to help others heal, and succeed. Writing has been a dream of mine for years. Sometimes I still need to pinch myself to realize I am actually writing a blog. Funny how a dream is never what you think it will be… it’s better and worse in so many ways … always. Right? For the most part, this experience is better than I thought it would be, connecting with others … amazing experience I treasure. The down side would only be the critical nature my mind can offer up, which is where my angels come in to this picture, so many Clarences I seem to have in my corner. When I began the blog, no doubt it was terrifying. But once I pressed send, it was kind of like being strapped into a carnival ride … you’re there for the duration. When I was small, my friend Colleen and I climbed aboard the Scrambler. We were pretty young, probably about fourth grade. We laughed so hard throughout the whole ride that we never opened our eyes. I can’t remember now who’s parents were waiting for us, but I just remember they thought we were feeling sick based on watching us with our eyes closed throughout the duration of the ride. Quite the opposite, we had just had the ride of our lives. This blog has felt much the same. I do need to close my eyes and my mind at times once I press send, and allow myself a little while to return to the computer, but I’m always just about as exhilarated as that ride once I do. Since I left work, I’ve been experiencing a huge limbo factor as you might expect. And numerous times I’ve wondered, is the story over? Have I written what I needed to write or is there more? I’ve accomplished my goal, the yoga class, and the end of my career at Virgin. It was a natural breaking point. Was the blog over? I could see both paths, and what I didn’t want to do was work to find something to post about. The class offered up such great material … would life do the same? That question on paper now is almost funny, but not when you are in your head thinking through continuing to place your soul on the screen on a continuing basis. After weeks of pondering, I decided that life would always offer up a great deal to chat about, maybe just not three posts a week worth. And that once a week would be a great goal. Finally comfortable with that idea, last week I sat down to write. I felt almost like I did when I started, excited, giddy and confident again, knowing I had a great deal more of the story to continue with. And this is where my angels reunite with this post. I received two comments on my wordpress account. I many times receive comments from my friends on Facebook, God bless them, they have helped me (more than they will ever know) find the courage to continue and become even braver as I write. But strangers are a whole different animal. It’s like a hand reaching out from the dark. They aren’t reaching because they are your loved one … they are reaching back to share their support for you, a complete stranger. Having just finished writing in a sense a post where I was committing myself again to this blog (even though no one would ever know that) these two people sent messages that were beyond encouraging. I actually sat for a few minutes quietly in disbelief after I read them. If I had been asked to craft an exact message that I needed at that point in time, I couldn’t have done a better job. Coincidence? No, not in my book. Their heartfelt messages made me think of my favorite movie, about imperfect wonderful George, his influence on the world around him, my influences in this blog and otherwise, and my readers’ influences on the world. Magical connections … I’ve said it before in my blog, united we all could light the world. I hope you all watch the movie soon and recognize the George in you. My tagline from the start, “a blog about crossroads, change, aging, loss, health, stress, fitness, yoga, renewal …in other words life” I feel confident now that we have much more to share with each other. Thank you dear friends, for your amazing support. And a special thanks to Paul and Charlotte for reaching back. I’m just happy our paths have crossed, you’re a beacon of light in the void of the blogosphere. I am happy for that as well! I will tuck those words, a beacon of light, into my pocket for safekeeping.